and enables you to reduce risks and detect suspicious user behavior in time to stop a breach. Classify and tag both unstructured and structured data regardless of its location so you can prioritize the security of sensitive information. Apply security policies consistently across multiple data repositories. 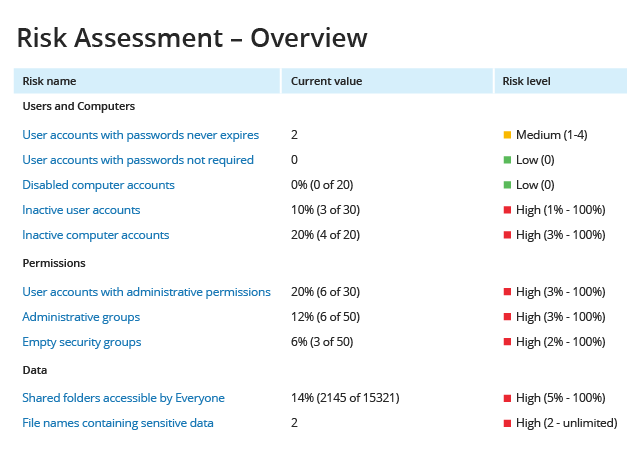 See which pieces of sensitive data are most at risk so you can prioritize remediation of those risks. 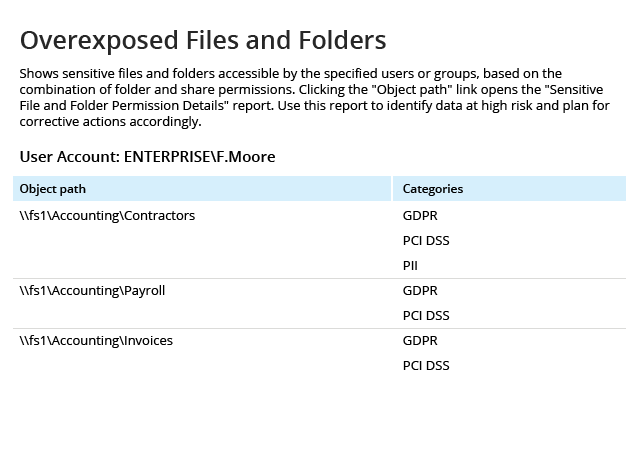 Netwrix Auditor helps you identify sensitive information that is exposed to a large number of users without a business need or that is stored in an unsecure location. 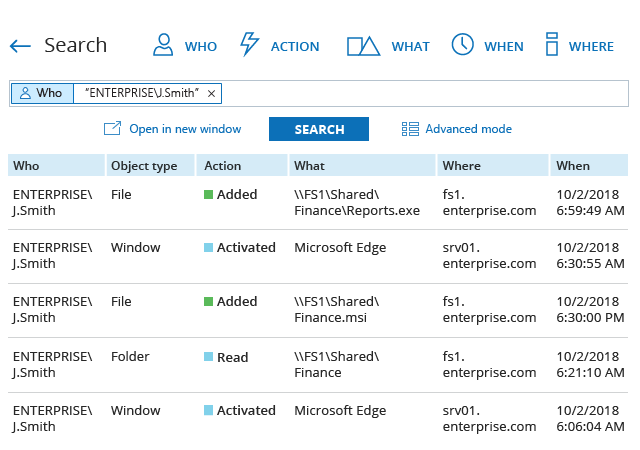 Identify both data and infrastructure security gaps, such as a large number of directly assigned permissions or too many inactive user accounts. Continuously evaluate these security metrics and focus on what’s most important. 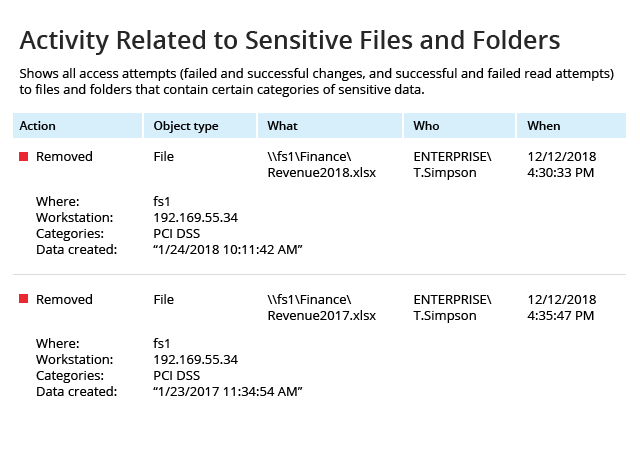 If a sensitive file pops up in an unexpected location, automatically move it to a quarantine area until you can determine where it should be stored and who should have access to it. If access controls around sensitive data are not risk-appropriate, automatically remove all rights to read or modify that data from global access groups like Everyone using this data security software. See who has access to what sensitive data and how they got that access, and enable data owners to regularly verify that these rights are in line with business needs. If they aren’t, remove excessive permissions to enforce the least-privilege principle and keep risk at an acceptable level. Reduce the risk of exposure of confidential information by automatically redacting sensitive content from documents if there’s no business requirement for it to be there. Maintain productivity by keeping the rest of the document intact. Non-sensitive items tagged by mistake do not require protection. Leverage high-precision classification tags written by Netwrix Auditor to increase the accuracy of endpoint security software, data loss prevention solutions and other IT security technologies and products you’ve invested in. modify or delete sensitive data without being caught. revert any improper changes to reduce risk and protect data. Promptly detect even subtle signs of possible data security threats in progress, such as unusual logons, unsanctioned remote access to your network or users accessing sensitive data they haven’t accessed before. 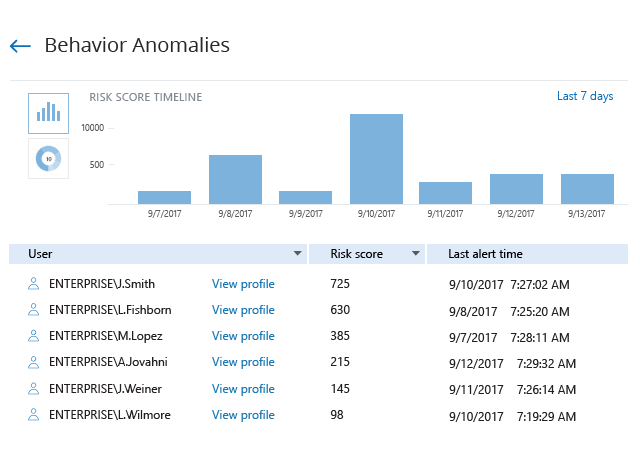 Easily identify and investigate the users who pose the most risk with an aggregated view of the anomalous activity by each individual. Carefully monitor the activity of third-party user accounts in any system or application, even if it doesn’t produce any logs, to ensure full accountability. Get notified anytime a vendor does something outside of their scope of activity, since their unauthorized actions could put your data at risk. Quickly get to the bottom of incidents involving sensitive data: Understand exactly what happened, how it happened, who was behind it and which pieces of information were actually read, modified or deleted. Use this valuable context to formulate the best response to each incident in as little time as possible. 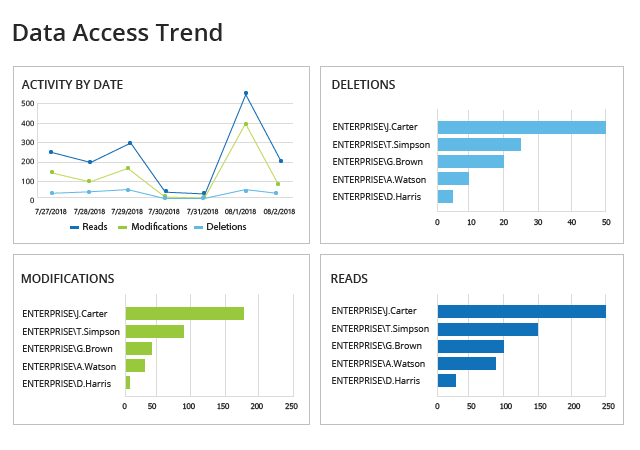 React to data security threats faster by automating response to anticipated incidents. You can act decisively by disabling suspicious accounts or terminating active user sessions. 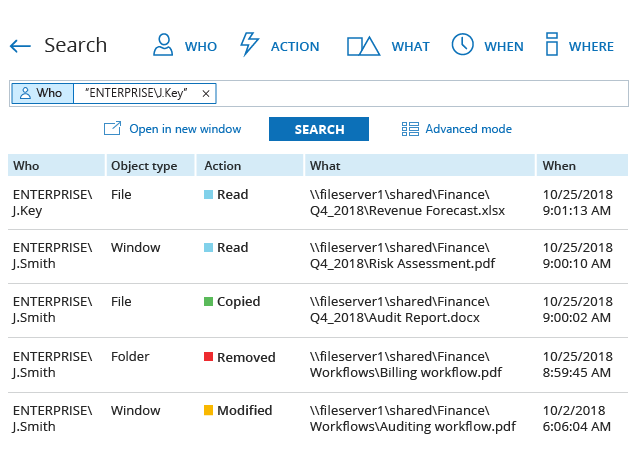 Alternatively, you can provide initial incident support and enable faster, more accurate investigations by integrating Netwrix Auditor into your SecOps process. 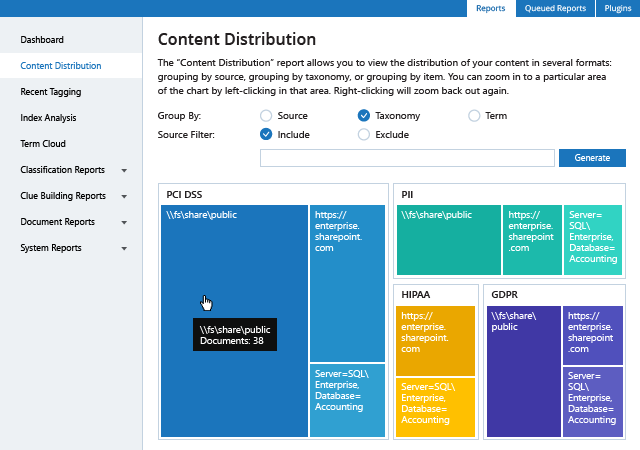 Analyze how much data a malicious insider or a compromised account had access to and exactly which pieces of data were actually viewed, modified or deleted. 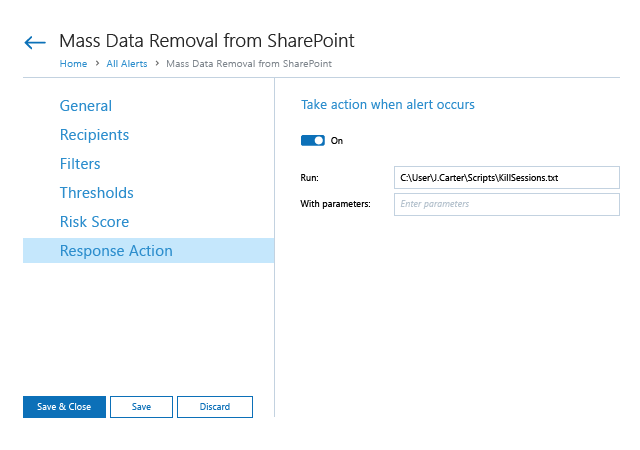 Use this information to determine whether you need to report the incident and, if necessary, comply with breach notification requirements by notifying all affected parties. 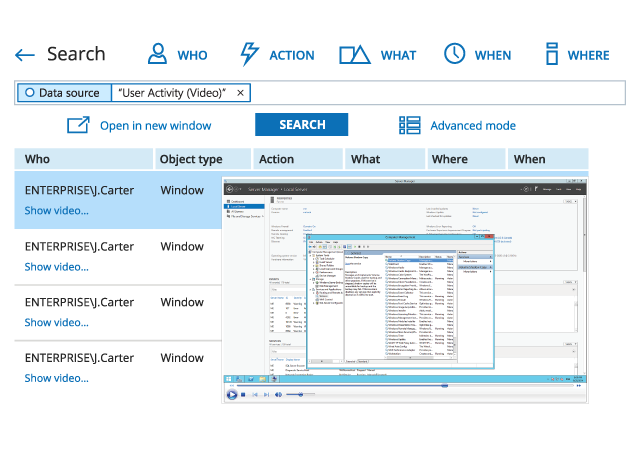 Inventory your data and see where the most sensitive or business-critical data is located. Create information recovery plans that prioritize the restoration of this information. Determine which sensitive, confidential or mission-critical data was corrupted during the attack and prioritize its recovery. 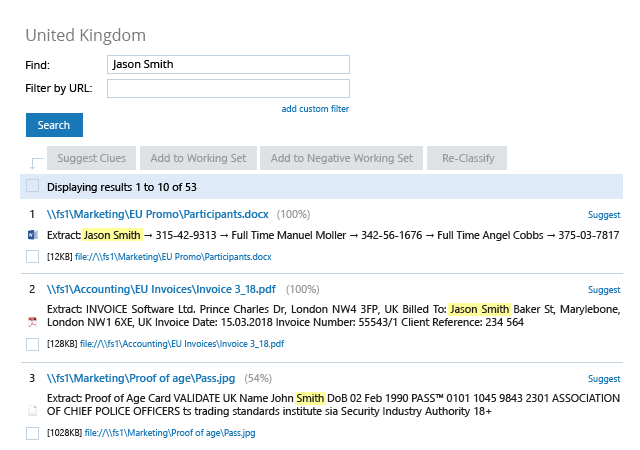 See who had what access to these documents to get your business users productive as soon as possible. Analyze exactly how a security incident occurred and use this information to improve your data security strategy and prevent similar incidents in the future. Implement compliance controls across your entire infrastructure and regularly check whether they work as intended. If written security policies differ from what’s actually in place, fix your faulty data security controls before auditors discover them. 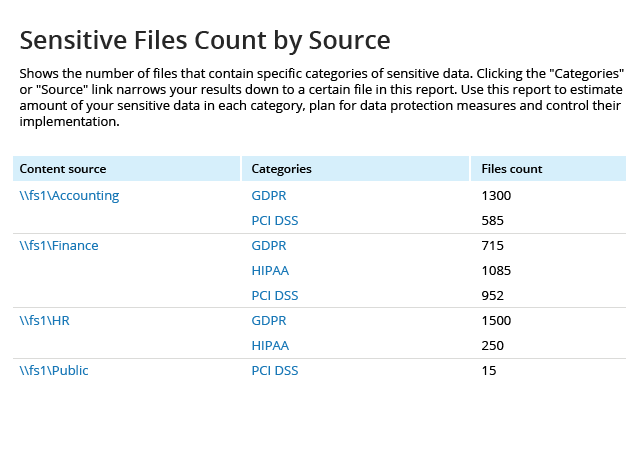 Easily find all data you store about a particular data subject when they exercise their privacy rights under GDPR, CCPA and other modern regulations. Provide them with a list of this information or erase it if they withdraw their consent. 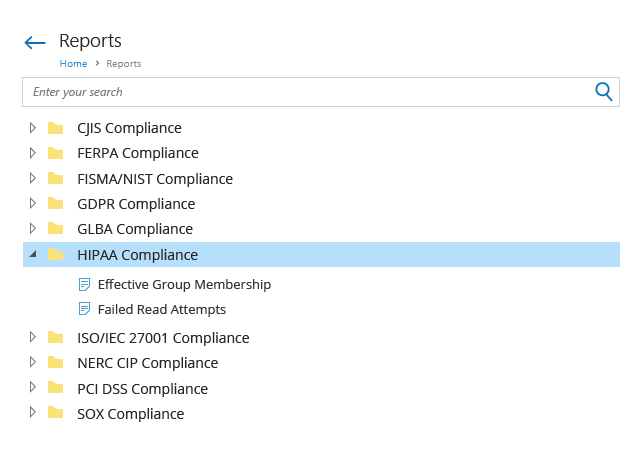 Prepare for the bulk of auditors’ requests by taking advantage of out-of-the-box reports aligned to the compliance controls of HIPAA/HITECH, PCI DSS, GDPR and other common regulations. 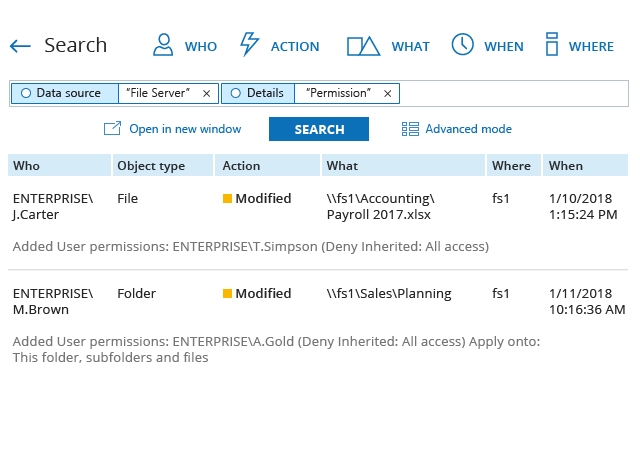 If there are unexpected questions during the audit, use the interactive search to quickly pull up the requested information on the spot. Netwrix provides a unified platform for monitoring what is going on across both data storages and backbone systems. This visibility enables our customers to understand where sensitive data is located, what the risks around it are and what activity is threatening its security. 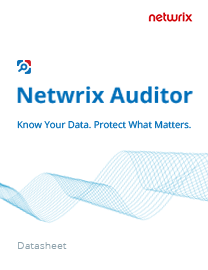 See the full list of Netwrix Auditor advantages and learn how this data security platform can help you address your most pressing information protection challenges. Forreston State Bank relies on Netwrix Auditor to achieve continuous compliance with FFIEC and GLBA. Horizon Leisure Centres accelerates data classification to comply with GDPR and respond to subject access requests. The National Weather Service uses Netwrix Auditor to simplify compliance reporting and audit preparation. Perfetti Van Melle Turkey secures its exclusive confectionery recipes and enforces internal security policies.